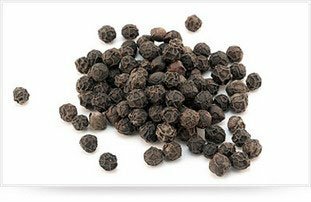 White and black pepper are the most commonly used in the kitchen, their tastes are similar, and it's mostly for aesthetic reasons that one is used rather than the other. It's worth using white pepper when you don't want to see small black grains in your dish. Have 2 pepper mills if possible: one with white pepper and the other with black pepper. In this way you can be sure that you add pepper and only pepper to your recipe (with commercially ground pepper, who knows?). Your pepper will always be fresh; once ground it soon loses its flavour. To add pepper to a dish to be served raw (salad, vinaigrette,...) no problem, just grind with the mill when needed. For cooking with pepper, it's a bit different because pepper eventually gives a bitter taste during cooking, due to its tannin. Auguste Escoffier (confirmed by Hervé This) says that this happens after about 8 minutes of cooking, so you should so try to avoid cooking pepper more than this, and add it "at the right time...".